During this episode we will look at the German path to unleashing their U-Boats first in a perfectly legal commerce raiding campaign and then onto a perfectly illegal unrestricted commerce raiding campaign which they will then cancel just 7 months after it started. Commerce raiding while at war was a long and storied profession, it dates all the way back to the earliest naval warfare and by 1914 it had a well-documented set of rules that all sides were expected to obey. The key to all of these rules was to avoid the death of civilians whenever possible so a surface commerce raider generally just had to find a merchant ship and tell it to surrender. Submarines on the other hand had to surface, notify the ship of its intensions, and then hope that the ship played along. Unlike most of the commerce raiders during the war the U-Boats did not significantly outclass the commerce ships in armor and speed and it had to give up its advantage in stealth when it surfaced. The British would take advantage of this situation during the first year of the war and they are just as responsible for the German decision to just start sinking everything in the North Sea as the Germans are. Obviously things are a bit more complicated than those three sentences which is why I will now spend the next 20 minutes or so discussing this topic. To understand why the Germans would eventually decide to declare unrestricted submarine warfare it is important to understand the part of the economic situation in Germany before the war, especially as it relates to food. Germany had to important a portion of their food before the war, they just did not produce enough domestically and their biggest source was Russia. Obviously Russia was off the table as a supplier once the war started so Germany turned to the second largest source of food before the war, Hungary. Hungary was on Germany's side for the war but mobilization in the fall of 1914 had a very negative effect on the harvest. I think I just barely mentioned the harvest last year around the start of the war but it was a serious problem for several countries during 1914. The war started just as the harvest was going to start, and the harvest in 1914 was still done, for the most part, through manual labor. With these two sources of food off the table for Germany the next best option was to import the supplies from overseas, but the British blockade made this difficult. The British were perfectly positioned to block all trade in and out of Germany, and they had the largest navy in the world, hell, blockading continental powers and protecting British trade were the two reasons the Royal Navy even existed at this point. Their blockade would not be air tight early in the war a lot of material got through to German ports, but it would have a huge effect later as the war drew to a close. The first step was to turn the North Sea into a warzone, this meant that all merchant ships could not go anywhere in the North Sea or the British would capture or sink them. The British demanded that any shipping destined to anywhere in the North sea had to go through the English channel, where the flow the shipping could be easily controlled by British checkpoints. Germany of course protested this change to anybody that would listen, as we have discussed, but these protests did not instantly lead to them sinking any ship that moved, instead they would find focus on a campaign of restricted, and legal, targeting of merchant ships. Early in November 1914 the discussion began in the halls of the Imperial Navy on how they could hit back at the British blockade. The goal would not be to actually attack the warships that were maintaining the blockade, the U-Boats were already doing that and making some headway but not enough. The goal was instead to institute a kind of counter blockade of British trade. The High Seas Fleet was ruled out as an option to perform this task due to the danger that the ships were placed in every time they left port and so all thoughts turned to the U-Boats. The Chief of the Admiralty Staff Hugo von Pohl, who we will talk about a lot today, began to prepare a document for presentation to the other German leaders including the Kaiser. In this document he would propose an unrestricted commerce raiding campaign to be executed by the U-Boat fleet. He would put down some of this thoughts on why this was the right course of action in these words ‘As England is trying to destroy our trade it is only fair if we retaliate by carrying on the campaign against her trade by all possible means. Further, as England completely disregards international law in her actions, there is not the least reason why we should exercise any restraint in our conduct of the war. We can wound England most seriously by injuring her trade. 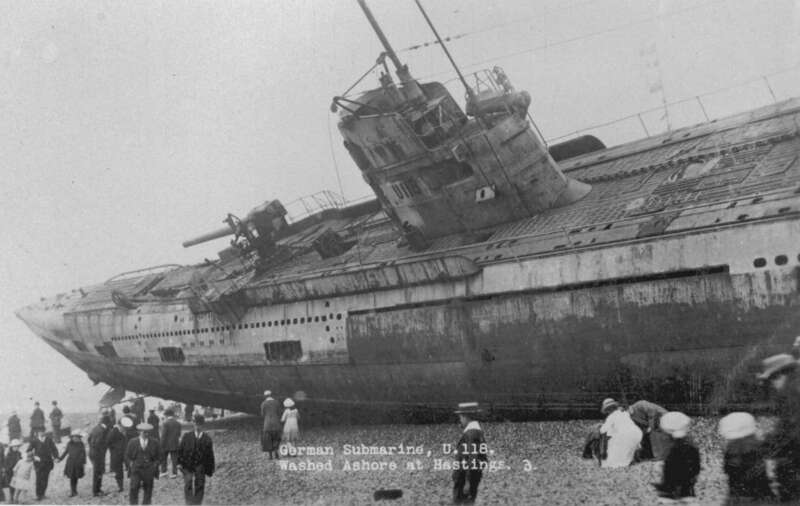 By means of the U-boat we should be able to inflict the greatest injury.’ The British restrictions made the idea of using the U-Boats to interrupt trade an easy sell to the German leaders, however there was concern about the unrestricted nature of what was being proposed. Chancellor Bethmann-Hollweg was concerned about the views of neutral countries to such a campaign. The campaign would almost certainly result in the sinking of vessels from neutral countries. These countries might then enter the war against Germany. Because of these concerns, which were shared by the Kaiser there were strict limits placed on the U-Boats actions. These limits made sure that everything was done within International law. So the U-Boats would start being sent out on patrol to interdict British vessels that were bound for the British Isles they had a very strict set of rules for engagement. First, if such ships were found they would be subject to a search, if they were carrying wartime material the ship could either be captured and brought to German ports, which was an extremely unlikely outcome, or they could be sank in one of three ways: by shelling, torpedoes, or the opening of the ships seacocks. All of this would of course be done after the passengers on board had been conveyed to safety. The only time a merchant ship would be outright attacked was if it failed to yield when prompted by a U-Boat. Even with all of these stringent restrictions placed on the U-Boat captains there was still concern about the reaction of neutral countries and it would be a situation that would be constantly monitored by German leaders. Von Pohl continued to believe that Germany had to begin a fully unrestricted campaign soon if it was ever to make a real difference. Von Pohl would eventually be able to convince the Kaiser that it was a necessity after two events occurred that shifted the situation at sea. The first was a series of events that all involved the shady British anti-submarine tactics that I discussed last week. Tactics like arming merchant ships and disguising them as neutral ships or the complicated schemes to coax U-Boats into traps by turning fishing ships into warships. All of these instances just added to the feeling that Germany was trying to play by the rule imposed upon them while the British were flagrantly flaunting them. The second event that tipped scale was the battle of Dogger bank and the defeat suffered there by the High Seas Fleet. The battle would keep the fleet in port for the rest of the year and it also inflamed public opinion back home that something simply had to be done by Germany in the war at sea. The effects of Dogger Bank would end up being decisive as it turned unrestricted warfare into the last option for Germany to try and take the initiative in the war at sea instead of just sitting in harbor for the duration. Even though Dogger Bank brought around the important votes of the Kaiser and Tirpitz, universal support remained illusive. Bethmann-Hollweg was still against the campaign for the same reasons as before, the neutrals. He was able to be convinced that the duration of the campaign would be short, so that even if the neutral countries hated it, they would only hate it for about 6 weeks which was the expected time it would take for the British to be forced to break the German blockade. There were also some very valid concerns about the upcoming campaign from high ranking members of the German navy, their concerns were more in the practical and logistical realm. They believed that Germany just did not have enough U-Boats to make it work. Due to casualties in the fleet of submarines that had started the war, and even factoring in new boats that had come online during the first 6 months there were still only about 20 U-Boats in February 1915. This group believed that it would be better to wait until the summer of 1915 before starting the campaign so that more U-Boats can be launched. Most of the estimates at the time believed that it would require at least 200 U-Boats before the ocean could be sufficiently closed around the British Isles to have the desired effect. While this number seems large, due to the size of the ocean it probably would not have been enough. They would never reach the production capacities that would make getting that many U-Boats operational at the same time, so it is sort of an academic argument, but in WW2 they probably got close to that number of operation U-Boats in the Atlantic at one time and even then they were only able to stop a small fraction of Allied Shipping. I have to be honest and say I'm not positive on that World War 2 fact, it is actually deceptively hard to find solid information online about the exact number of operational German U-Boats were present at any given time during either war. Most of the information readily available deals with how much shipping they sank or how many boats were lost. So anyway, that is a pretty big digression, suffice to say, in 1915 Germany did not have enough U-Boats, period. The proclamation would be made on February 4th and it was sent out to make sure it was well publicized. Here are two quotes from the proclamation that I pulled from The U-Boat War 1914-1918 "All the water surrounding Great Britain and Ireland and all English seas are hereby declared to be a war area. From 18 February all ships of the enemy mercantile marine in these waters will be destroyed, and it will not always be possible to avoid danger to the crews and passengers thereon. ‘The shipping route round the north of the Shetlands, in the east of the North Sea, and over a distance of thirty miles along the coast of the Netherlands will not be dangerous. These measures by the German Government are worthy of note by neutral countries as counter-measures against English methods, which are contrary to international law, and they will help to bring neutral shipping into closer touch with Germany. ‘The German Government announces its intentions in good time, so that both neutral and enemy shipping can take the necessary steps accordingly." Next the proclamation would address what could happen to neutral ships "Neutral ships, too, will run a risk in the War Zone, for in view of the misuse of neutral flags by the British Government on 31 January, and owing to the hazards of naval warfare, it may not always be possible to prevent the attacks meant for hostile ships from being directed against neutral ships." The orders that were then sent to the U-Boat commanders left no doubt as to what the new rules of engagement would be "Your first consideration is the safety of the U-boat. Consequently rising to the surface in order to examine a ship must be avoided for the sake of the boat’s safety, aside from the danger of a possible surprise attack by enemy ships, because there is no guarantee that you are not dealing with an enemy ship even though it bears the distinguishing marks of a neutral. The fact that a steamer flies a neutral flag … is no guarantee that it is really a neutral vessel. Its destruction will therefore be justifiable unless other attendant circumstances indicate neutrality." This proclamation and these orders would change the war drastically ,and the British press lost no time in using it in the ever ongoing propaganda war. The Times wrote that it all represented "further deeds of so desperate and abominable a character as to involve the lives of innocent neutrals, the sanctity of the American flag, and the safety of American shipping." After the orders were distributed to the fleet the German leadership almost instantly began to get cold feet, similar to what happened during July 1914 when the Kaiser and Bethmann-Wollweg waffled on the brink of war. This resulted in the a change in dates for the start of the campaign. Originally the Germans had been planning on starting the campaign on February 19th, giving the world 2 weeks notice. However on the 14th a new set of instructions were sent to the U-Boat commanders with these words "U-boats (are) not to attack ships flying a neutral flag unless recognized with certainty to be enemies" which obviously completely contradicts the previous order. With this contradictory order there also came news that it was delayed until a date that was not yet determined. During this time I am sure von Pohl was going a bit batty trying to counter act all of the back pedaling from his colleagues. It was finally decided that, for realsies this time, the campaign would begin on February 22nd. With this news came one final set of instructions, of which I will read all 7. "1. The U-boat campaign against commerce is to be prosecuted with all possible vigour. 2. Hostile merchant ships are to be destroyed. 3. Neutral ships are to be spared. A neutral flag or funnel marks of neutral steamship lines are not to be regarded, however, as sufficient guarantee in themselves of neutral nationality. Nor does the possession of further distinguishing neutral marks furnish absolute certainty. The commander must take into account all accompanying circumstances that may enable him to recognise the nationality of the ship; e.g. structure, place of registration, course, and general behaviour. 4. Merchant ships with a neutral flag travelling in convoy are thereby proved neutral. 5. Hospital ships are to be spared. They may only be attacked when they are obviously being used for the transport of troops from England to France. 6. Ships belonging to the Belgian Relief Commission are likewise to be spared. 7. If in spite of the exercise of great care mistakes should be made the commander will not be held responsible." So in regards to neutral shipping the commanders were asked to make a judgement call but were specifically told that what the ship looked like should not be considered, but they were then told that they would not be held responsible for their mistakes. It would quickly become apparent that the Germans would have saved a lot of ink if they would have just had 1 instruction in the final orders that read "Sink the ships, all of the ships, oh except for Hospital and Belgian relief commission ships, other than that all of them." because that is pretty much what happened. I have said the word neutral 24 times in this podcast up to this point, and while all neutrals were important there was one that was more important than all the others combined, the United States of America. The Germans hoped that the campaign would not start a fire among the American public while the British were trying to stoke that fire as fast as possible. Before they started any form of commerce raiding Admiral Tirpitz used an interview with an American journalist to let the idea of the unrestricted campaign drop out there. The response from the American public was disheartening for the Germans to say the least. Unfortunately for Germany Americans did not see the idea of unrestricted warfare in the same light as the British blockade. The American government was probably more sympathetic to the German argument than the public though, they had been protesting the British actions since the beginning of the war, particularly the British impersonating American ships. They mostly just firmly requested that the British stop doing that, but they could protest all that they want, technically it was not illegal though, so firmly request is all they could do. The British would then hear their request and then promptly remind all of their merchant ship captains that using false flags was a completely legal act and they should really keep doing it. In fact, they gave definitive instructions that they should fly neutral flags, especially American flags, when approaching the English channel. The British knew what was to their best interest in all of this of course. Now all of the actions were not well known during the war, for understandable reasons the British did not brag about them. When it came to the unrestricted declaration though, it was a very public campaign and when the proclamation was released President Woodrow Wilson would release a statement criticizing the new engagement rules "to declare or exercise a right to attack and destroy any vessel entering a prescribed area of the high seas without first certainly determining its belligerent nationality and the contraband character of its cargo would e an act....unprecedented in naval warfare." This would be the official response of the president, even though many of his advisors exerted a lot of pressure on him to make it even stronger. The American public would not be as calm as their president, and there was an event that was about to make it all a lot worse, a little event that involved a ship called the Lusitania. I am not going to go into too much detail about the sinking of the Lusitania and its aftermath, all of that was covered back in Episode 35, but here is just a quick refresh. Over a thousand people went down with the Lusitania sank after being hit by a torpedo shot by a U-Boat. 128 of those deaths were Americans. Once this even happened many of President Wilson's advisors wanted him to break all diplomatic relations with Germany, or even just outright declare war. Wilson, still hoping to keep America out of the war, chose a more reserved response and this would be part of his message "American citizens act within their indisputable rights...in traveling wherever their legitimate business calls them upon the high seas, and exercise those rights in what should be the well-justified confidence that their lives will not be endangered by acts done in clear violation of universally acknowledged international obligations" This response made it clear that further incidents might have consequences and it made the Kaiser and Bethmann-Hollweg start to reconsider the entire campaign. The problem for both of these men was that the campaign, while hated everywhere else, was loved by the people of Germany and calling it off, even if they tried to keep it a secret, would eventually be very unpopular with Germans. So instead of calling it off they began to make some changes to the campaign to try and prevent further incidents. The first change was to order the U-Boats to only sink ships that the captain could tell the flag of, which was essentially just a reiteration of previous orders. The second order was to just straight up forbid the sinking of large passenger liners. These changes made the entire campaign a bit less of a threat to the British, passenger liners had been requisitioned at the start of the war and were used all the time for transporting military cargo. The second order was in response to yet another incident that occurred, the passenger liner Arabic was sunk with 3 Americans on board. This occurred in the middle of August, just as everything had calmed down in America after the Lusitania and suddenly the public was back up in arms. Again, Wilson's advisors recommended breaking ties with Berlin and again he would refuse to bow to the pressure. He did tell the Secretary of State to tell the Germans that they had to completely disavow the sinking immediately. In The Great War at Sea Lawrence Sondhaus claims that Lansing then proceeded to deliver the message to the German embassy, but he massaged the wording in such a way that it sounded far more harsh than Wilson intended. The message that the Germans received was that if the unrestricted warfare campaign was not immediately stopped, the United States would enter the war. With this misconception in mind there was a meeting where all of the German decision makers on August 26th to decide the fate of the campaign. Tirpitz and von Pohl dug in even harder that it was the correct course of action, their reasoning was simply that if the U-Boats were going to be at all effective this was the only way. Bethmann-Hollweg dug in on the other side of the argument, insisting that the campaign must end immediately instead of risking further animosity from the neutral nations. Bethmann-Hollweg also threw out a little jab at the Navy saying that they had guaranteed results in just 6 weeks and here they were 6 months later. If it had not caused huge changes yet, how long would it take? On the 27th all U-Boats were told to stay in port until the situation was decided. This may have been a move by von Pohl in protest to the orders not to sink passenger liners without warning, something that he believed endangered the U-Boats far too much. The situation on the 27th went so far that Tirpitz submitted his resignation and it became clear that the campaign would not continue. This resignation was firmly rejected by the Kaiser but it would mean the end of Tirpitz's real power within the government, from then on he would simply be a figurehead kept around for his name with the people more than anything else. On September the 18th the campaign would officially come to an end and orders were sent to all captains to return to the previous set of rules of engagement. Over the course of 7 months of unrestricted warfare the U-Boats had sunk almost 800,000 tons of shipping with the loss of 15 U-Boats, while this number seems very large, in reality it was not enough to make a huge difference in the war. This would be a problem in both world wars for Germany, when you hear the number of tons they are sinking with the U-Boats it seems like a huge deal, hundreds of thousands, even millions of tons. However, when you look at the total amount of shipping that was going in and out of the British Isles during the same time frames it really only boils down to a tiny fraction of the total. The 800,000 tons hurt, sure, but it was nowhere near bringing the British to their knees or enough to cause them to reconsider the blockade. At the end of the day the results of 7 months of unrestricted warfare in 1915 were pretty simple. Some ships were sank, America was angry, and both sides learned some very valuable lessons on how best to use and to counter submarines. All of these lessons would be put to good use when the unrestricted submarine campaign made a comeback in 1917.